Delray Beach Florida is a popular and beautiful 2-mile beach and just as sophisticated as its neighbor to the north, Palm Beach, but its a little more laid-back and maybe a wee more comfortable for folks looking for serenity and solitude. 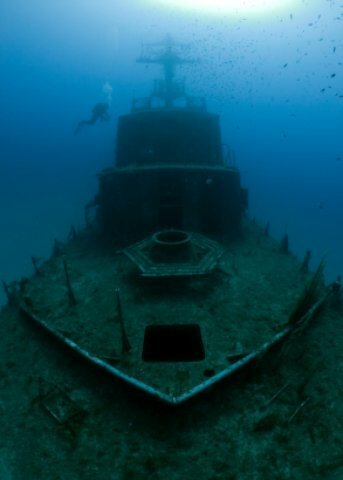 Divers love to explore this ship at the bottom of the ocean. (Name origin and date of demise are unknown). Delray Beach is a fave with divers and snorkelers who come here to explore the underwater remnants of a 1902 shipwreck just off the coast. Surfers can catch some excellent waves and water sports enthusiasts can find their very own sanctuaries. Daily temps on Delray Beach average in the 80’s so the water stays warm and beckons all you snow birds in the frozen tundra, which we southerners call everything north of Arkansas, (and sometimes we are not sure about Arkansas) to come on down and thaw out here. During the day, Delray Beach Florida is a very relaxing and peaceful beach escape and at night, it quickly transitions into a hip nightspot with many great dance clubs and bars. While all are welcome, this beach is a little less a family beach than an adult and singles beach mainly because of the exciting nightlife that arrives as soon as the sun goes down. Enjoy a leisurely afternoon of window shopping, eating in quaint little cafes and restaurants or enjoy the wide array of night life on Atlantic Avenue, Delray Beach’s main road. Enjoy art exhibits and catch one of the educational lectures at the nearby Boca Raton Museum of Art. Boca, as the natives call Boca Raton, is about a 30-minute drive south. Wakodahatchee Wetlands is an incredible ecosystem for nature lovers. Your kids may describe it as an underwater zoo for birds, turtles, alligators and frogs. Admission is free and you can walk the ¾ mile boardwalk above the water. It’s been compared to the Everglades, which is saying a lot. There’s lodging here if you want to stay in the middle of a natural wetland paradise and who would pass up an experience of a lifetime? Kids of most ages: The kids will enjoy playing in the golden sand but when they need a respite from the sun, take them to Daggerwing Nature Center. Daggerwing Nature Center features birds primarily and provides some great nature trails complete with herons, egrets, woodpeckers and more. You can even go on a night walk to see some owls. Eating: For some great sushi and Japanese food, check out Furin Japanese Restaurant. Boston’s on the Beach is just one of the great bars/ clubs here, but you can enjoy great food and fun here during the day too. Make a reservation at Pastis for some French or Italian cuisine at affordable prices. Sleeping: This is a popular vacation spot, so you have a lot of choices. For a relaxing beach retreat, stay in Wright by the Sea or The Seagate Hotel and Spa.